Below are a list of common issues and their known resolutions. From time to time, issues may arise that require an admin to resolve them. Below are some known issues that can occur, as well as their resolutions or workarounds. After assigning new or updated licenses to an existing Portal installation (see Applying Product Licenses ), it is necessary to recycle the B1WebAPI as well as the Portal IIS application pools before license changes will take effect. On the server that hosts B1WebAPI, open IIS. In IIS, recycle the Application Pool assigned to B1WebAPI (See How to Recycle an IIS Application Pool). On the server that hosts Portal websites, open IIS. In IIS, recycle the Application Pools assigned to any Portal website (See How to Recycle an IIS Application Pool). 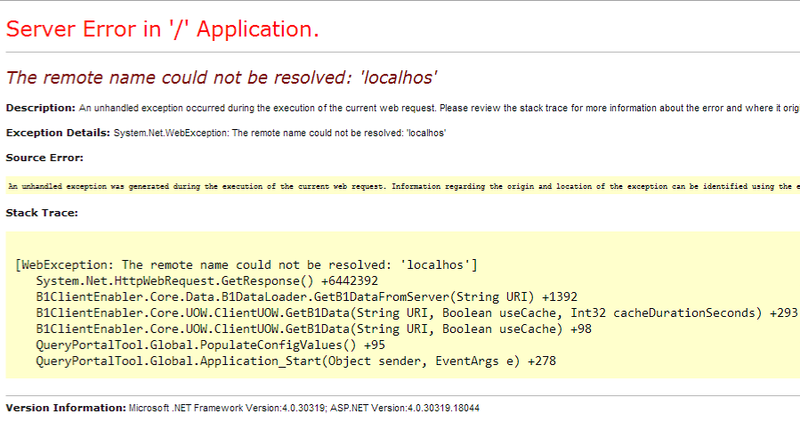 Cause: The B1WebAPI may lose its connection to the SAP Business One company and display this error. If InterConnect Server Tools is running, exit before continuing. If InterConnect Manager Add-On for SAP Business One is running, restart it before proceeding. If the Portal can’t connect or displays one of the following error messages, perform the steps outlined below. Error message: Server Error in / Application - Invalid URI: Invalid port specified. 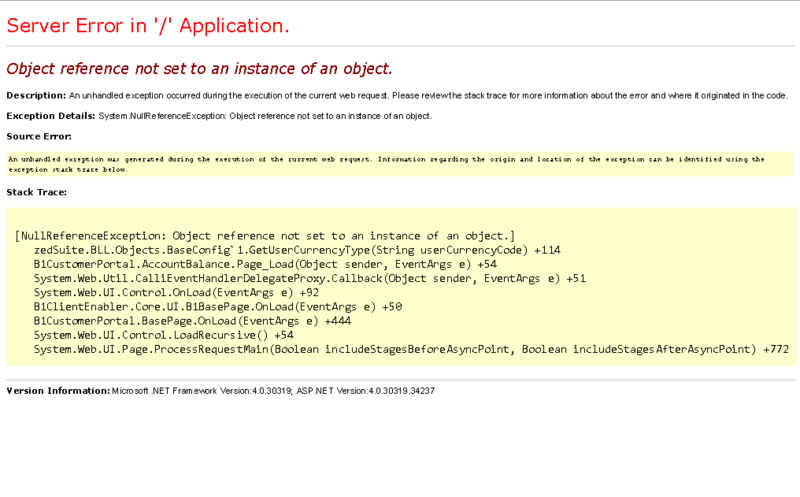 This error indicates that the Portal website is trying to connect to the B1WebAPI on a URI or port that is invalid. Typically, this is a typo in the B1WebAPI URL or port that has been configured on the Portal website. See details below for how to update the B1WebAPI URL and port. 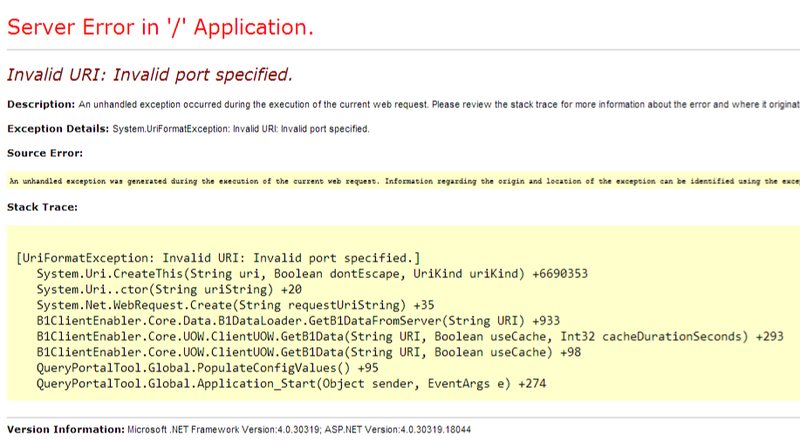 This error indicates that the Portal website is trying to connect to the B1WebAPI on the wrong port. This can also be caused by a firewall preventing access on the correct port. See details below for how to update an incorrect port. Error message: Server Error in / Application - The remote name could not be resolved. 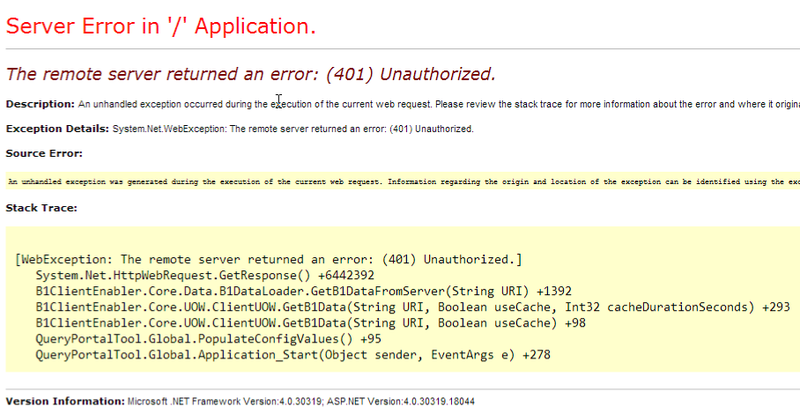 This error indicates that the Portal website can’t connect to the B1WebAPI. This typically means there is a typo in the URL used to connect to the B1WebAPI. It could also mean B1WebAPI is not installed, or that a firewall is in place which prevents the connection. See details below for how to resolve a URL typo. Error message: Server Error in / Application - The remote server returned an error: (401) Unauthorized. 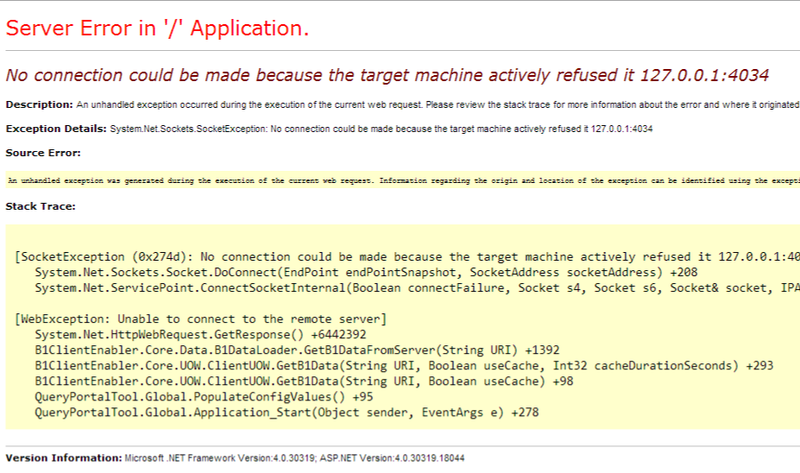 This error indicates that the B1WebAPI username or password assigned to the Portal website is incorrect. See details below for how to update the B1WebAPI username and password. To resolve errors caused by incorrect B1WebAPI URL, port, username or password, the Portal website’s web.config file must be updated. This file is contianed in the Portal website’s root directory. For Customer Portal, the default path is C:/inetpub/wwwroot/zed Customer Portal/. For Employee Portal, the default path is C:/Program Files (x86)/zedIT/zed Employee Portal/. For Vendor Portal, the default path is C:/Program Files (x86)/zedIT/zed Vendor Portal/. On the web server, navigate to the Portal website folder. Open the website’s web.config file. Look for a section called <b1ClientEnabler ... >. In this section, the URL (including port), username, or password can be updated. Saving this file will automatically restart the website and apply the connection changes. Ensure enablerHost is set to the full URL, port and (if applicable) profile of the B1WebAPI instance. For example, http://192.168.0.2:4033 or http://192.168.1.23:4033/prod. enablerDomain should be left blank. Ensure enablerUserName is correctly set to the B1WebAPI username. Ensure enablerPassword is correctly set to the B1WebAPI password. To fix certain errors, the web.config file for the website can be manually edited. enablerHost, enablerDomain, enablerUserName and enablerPassword must be correct. If it looks like the Portal is adding data or updating data in the wrong SAP Business One company, then the Portal itself may be configured to point to the wrong company. In this case, change the company configuration settings to point to the right company. The following screenshot shows an error that is caused by the ISO code not being set on the currency in SAP Business One. See Configuring Currency ISO Codes for instructions. This error is due to currency ISO codes not being set in SAP Business One. During licensing of a Portal with the License Administration section of InterConnect Server Tools, errors may occur which result in a pop-up error message. Below are some known errors and their resolutions. 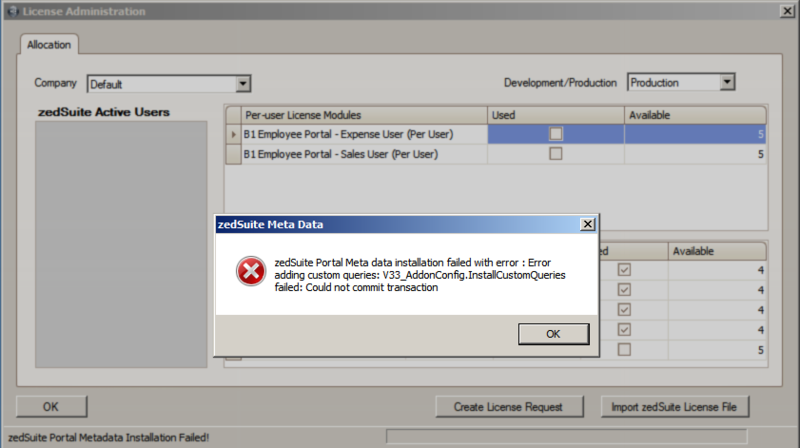 Error occurs after checking the Used column during license installation. Cause: This error is a generic SQL error on the SAP Business One database. However, it is usually caused by a SQL error in a stored procedure, such as SBO_SP_TransactionNotification or SBO_SP_PostTransactionNotice. Warning: Never edit a stored procedure without the approval of your SAP Business One Partner. These types of edits can disrupt your SAP Business One system. Resolution: This error can sometimes be resolved by correcting underlying SQL errors in the stored procedure. Speak with your SAP Business One Partner if you suspect this is the case. Symptom: The following error message is displayed when a customer with a foreign currency attempts to create an order using Order Pad for Customer Portal. Cause: This error is displayed when multi-currency is enabled, but exchange rates are not set up for the customer’s assigned currency. This is seen in order pad when the customer places an order with a foreign currency with unconfigured exchange rates or exchange rates that are not applicable to the current date.